Author of The ‘Great Satan’ vs. the ‘Mad Mullahs’: How the United States and Iran Demonize Each Other, Beeman is chair of the Department of Anthropology, University of Minnesota. TRITA PARSI, tparsi at niacouncil.org, @tparsi Parsi is president of the National Iranian American Council. He said today: “Extremely unusual. 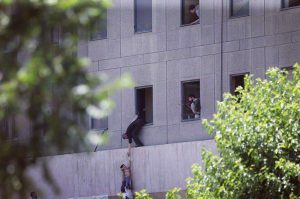 Last time a suicide bomber struck Tehran was decades ago. The target, Khomeini’s Mausoleum, is of course very symbolic. As the founder of the Islamic Republic, striking Khomeini’s mausoleum combined with the parliament sends a clear signal. “ISIS has had very little success striking inside Iran. Main reason is they can’t recruit Iranians easily, so no local knowledge. “Israel used MEK to penetrate Iran and assassinate Iranian nuclear scientists. The MEK were also the first to use suicide bombings in Iran. Ayatollah Khamenei is still immobile in one of his arms as a result of a 1980s MEK suicide attack targeting him. “For several years now, MEK’s been supported and funded by Saudi Arabia. Saudi likely funded the lavish campaign to get MEK off of the U.S. terror list. Mindful of the MEK’s status as the most detested group among Iranians, many questioned wisdom of Saudi backing the MEK. “But if the goal was to penetrate and destabilize Iran, the MEK clearly was Saudi Arabia’s best bet. “Still unclear who’s behind the current attack in Iran, but the MEK (and their Saudi backers) are a main suspect. Timing is of course curious. Just last month, A Saudi Crown Prince said Riyadh is working hard to take battle to inside of Iran. Parsi’s latest book is the just-released Losing an Enemy: Obama, Iran and the Triumph of Diplomacy.